Somewhere in-between a good smartphone camera and a compact interchangeable lens system lies a niche that may not have a ton of people in it, but someone thinks needs filling. The niche is for small cameras that are just as pocketable as phones but more powerful (optically speaking) and can connect to smartphones as well as the Internet for easy sharing by photo-obsessed social butterflies. Previously, this niche was filled by cameras like Canon's Powershot N and the Facebook Ready variant and the Sony QX series that came out last year. Now Samsung is introducing a camera that's not quite as small but adds a significant feature to the category: the ability to change lenses. The Samsung NX Mini, coming next month and starting at $450, combines some of the best aspects of a compact camera with the power of an interchangeable lens system. This 20 megapixel shooter boasts a speedy shutter, wide dynamic range, advanced controls (HDR, aperture priority, shutter priority, manual, and more), and video capture up to 1080p at 30 frames per second. 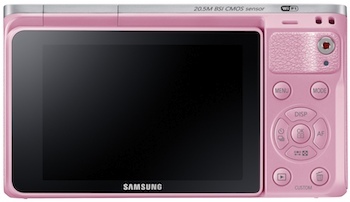 Like other products in Samsung's Smart Camera line, it has built-in Wi-Fi and NFC to make sharing images to a phone or tablet one-touch easy. The NX Mini will also upload directly to Dropbox and Flickr, no intermediary needed. At launch, you'll be able to buy the camera with a 9mm pancake lens ($450 kit) or a 9-27mm zoom lens ($550 kit). More lenses will be available later this year. 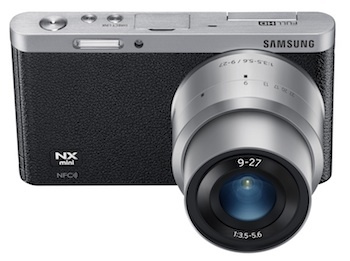 Samsung also announced an NX mount/adapter that allows you to attach any NX lens to the Mini if you desire. Of course, doing that will cut down on the camera's pocketability in a big way. With the 9mm lens attached the NX Mini is fairly compact and will slide into any jean pockets that would fit a smartphone. The zoom lens will add just enough thickness to make pocketing hard. Neither of them are as slim as the Powershot N. That lens is fixed, but telescopes almost completely flush with the body of the camera and offers 8x optical zoom. The NX Mini is overall larger than that camera, though it also has a larger (and perhaps better) sensor. The images you get out of the NX Mini should be superior--in my hands-on time I wasn't allowed to take any pictures away, so making that judgment will have to wait for a full review. Still, it looks like Samsung did a good job balancing size and weight with quality optics. The LCD screen only flips up 180 degrees--great for selfies, though the number of usable angles is limited. A 260-degree swivel would have been perfect. The menu system and navigation is simple to understand and use and contains some powerful options for those who know how to use them or care to learn. For people who just want to point, shoot, and take a great image, you'll find many Auto functions and scenes. Like the Sony QX series, owners of the NX Mini will need to connect the camera to their smartphones in order to share to Facebook, Instagram, Tumblr, and other social networks. That's an extra step and not as easy or simple as just snapping and uploading directly. People who fall on the side of wanting better pictures over simplicity will already be used to this, and with the NX Mini you get all the other benefits of a camera, such as an LCD for lining up shots that doesn't depend on a connection to a phone. Where both QX cameras may have a leg up is in the zoom, sensor, and processor departments. 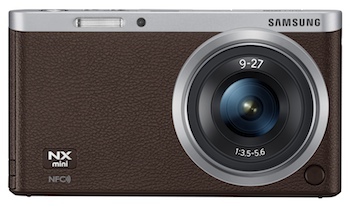 The Cyber-shot QX10 has a 10x optical zoom; the QX100 sports a wide-aperture Carl Zeiss Vario-Sonnar T lens and the same processor as the Sony RX100 II, one of the best compact cameras available. It will be interesting to see how the NX Mini compares to those cameras when it comes to image quality. With five colors ranging from brown and white to mint green and pink and some grippy, faux-leather accents on the front, the NX Mini is aimed at fashionistas, bloggers, vloggers, and other photo lovers who care about style. My first impression is that the Samsung NX Mini is a fun and cute camera with powerful features that might be a little much for the intended audience. Better pictures are always, well, better. And the ability to pull a camera from your pocket and snag a quick shot is much more in demand now that most people are used to being able to do so with their phones. But does the desire for better pictures trump the inconvenience of carrying an extra device and the hassle of getting it posted quickly to their favorite social media site? Samsung is hoping the answer is yes. This is an interchangeable lens camera (similar to a DSLR), so the zoom depends on what lens you have. The base kit comes with a 9mm lens (no zoom). Various zoom lenses are available. But the next lens up from the 9mm is over $200 extra which takes this camera to about $600 so not worth it at that price. But have learned something - should have bought the WB350F with the 21x zoom and other good features for about $200 all up! Thanks for the explanation. Interchangeable lens cameras are intended for photo enthusiasts who want the flexibility of multiple lenses and they’re not cheap (as you’ve realized). If it’s not too late, why don’t you return it and go with a more standard compact zoom camera from Canon or Panasonic? I guess I didn’t have the knowledge at the time to realise what this camera was really about - I was chasing one with a good zoom plus wanting fast shutter speed (for my hounds in action) - the selfie was a good extra and without a doubt it does take great pix…and has good reviews.